From tragedy the building was re-built and became a mercantile store. The Ben Franklin Mercantile was created in 1972 by Ken and Jean Stratton. The Ben Franklin was the five and dime that most locals used to purchase items from shampoo to knitting yarn. Many local adults once shopped at the Ben Franklin as children for school supplies and candy. The Ben Franklin Mercantile closed its doors in 1989 when Wal-Mart arrived in Steamboat Springs. Ken and Jean, realizing that Wal-Mart would slowly take over the local business of the five and dime, decided to remodel the building into a mall with several merchants. From this The Franklin Mall was born. The family recognized Kenton’s talent working with framed art pieces encouraged him to create a store specializing in contemporary western art. 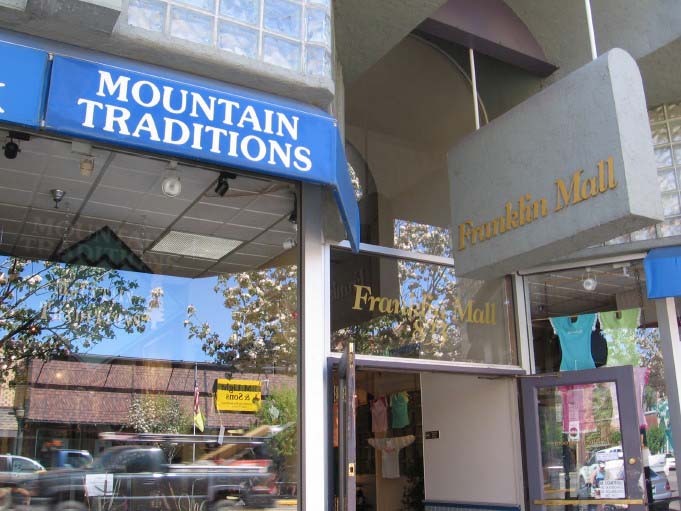 Mountain Traditions began in a small space at the back of the Franklin Mall. Kenton’s eye for art and ability to provide affordable pieces for the home proved worthy and within 5 years Mountain Traditions increased his inventory to fill two shop spaces. The store was moved to the front of the Mall and now enjoys the increased wall space for display of hundreds of framed pieces. Mountain Traditions has also expanded its inventory to home accessories and furniture in the mountain living theme. If you find yourself in Steamboat Springs, stop by to meet Kenton and visit our beautiful showroom. Keeping with the family traditions, Ken and Jean still manage the building and maintain a shop that also resides in the Mall, Favorite Things. Steamboat Springs is a thriving ski and summer resort known for it’s fantastic skiing and Olympic heritage. Otherwise known as Ski Town USA, Steamboat Springs has produced more Olympic athletes than any other community in the United States. To date a record 69 (and counting) athletes have gone to the Olympic games from Steamboat Springs, including 20 athletes in 2006 Games in Italy. Aside from the five-star skiing and Champagne Powder, Steamboat has become the premier summer vacation spot for the outdoor enthusiast. The Yampa Valley Curse states that you come for the winter and stay for the summer. The Curse has proven true for many locals as Steamboat offers some of the best hiking, fishing and camping in the region. Whether you choose winter or summer, Steamboat Springs welcomes you!